Get a taste of French culture in the South Pacific when you set sail on your New Caledonia Cruise. New Caledonia is the perfect destination for singles, couples and families where everyone's interests and expectations can be fulfilled. Experience a slice of paradise when visiting the Island which is home to an abundance of Parisian style restaurants, lively bars, clothing boutiques, and high end retails stores. Your New Caledonia Cruise from Sydney or Brisbane could pass through a number of exciting pacific island destinations to wet your cruising appetite before arriving in Noumea, Lifou or Mare. 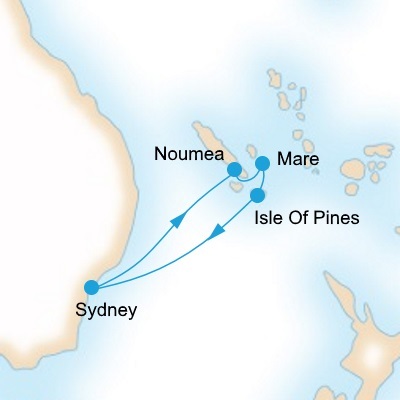 Cruises to New Caledonia depart from Sydney and Brisbane in Australia. Other worldwide ports visiting New Caledonian Islands include departures from Vancouver (Canada) and San Diego (USA). Some of the most popular Cruises to New Caledonia from Australia are run by Carnival Cruises. Departing from Sydney and Brisbane, the itineraries travel to the South Pacific Islands taking in some of the most beautiful islands in the world. Carnival's "Fun Ships" the Carnival Spirit and Carnival Legend are usually operating on these routes and are fantastic ships for families and children. Keep an eye out for Carnival Sales and Last Minute offers throughout the year. Holland America Line operates a 29 day itinerary from Vancouver or 25 day cruise from San Diego to Sydney stopping in Noumea, Hawaii, Fiji, Vanuatu and a number of other island destinations. Talk a walk through the morning markets at Port Moselle Marina. Explore the mountainous regions of Grande Terre where you'll find cascading waterfalls and the largest coral lagoon in the world. The island also boasts numerous water sporting activities such as snorkelling, fishing and boating. Sample some typical Kanak and French snacks, freshly baked croissants, fresh fruit, vegetables and honeycomb. For those wanting to try 'Kava' - a drink made from the roots of the Kava plant and known to give you a slight sedative / relaxed feeling - head to a Kava bar (look out for a red light outside!). The big liners regularly discount Cruises to New Caledonia at numerous times throughout the year. Make a booking enquiry now at no charge - even pay via Lay By!